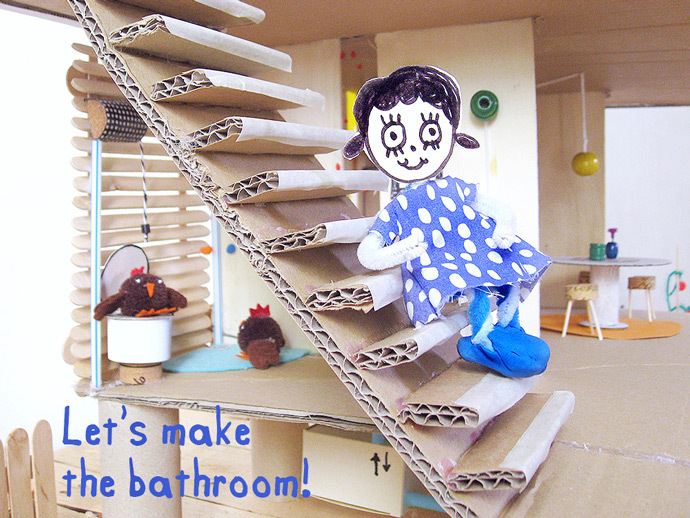 Let’s get back to work on the self-sustaining, eco-friendly dollhouse of our dreams! 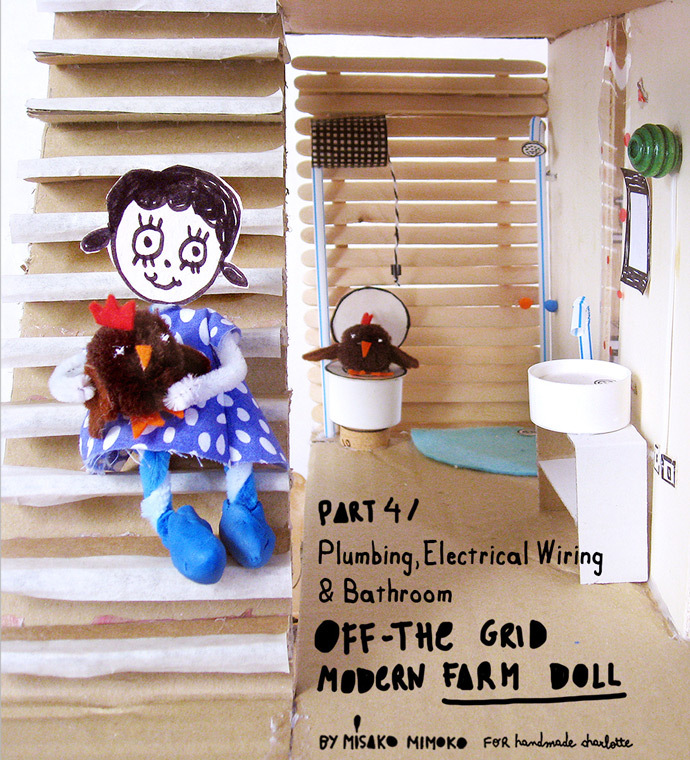 In this chapter, we’ll set up the farm’s electrical wiring, kitchen plumbing, and a tiny bathroom too. Kids will learn how everyday appliances get their power and water, and how to go green by taking short showers instead of baths and by installing a low-flow showerhead and faucet aerators to preserve water. Gather up some yarn, tape, cardboard, plastic lids, corks … any recycled materials you have on hand are great! Let’s have fun while saving the earth! 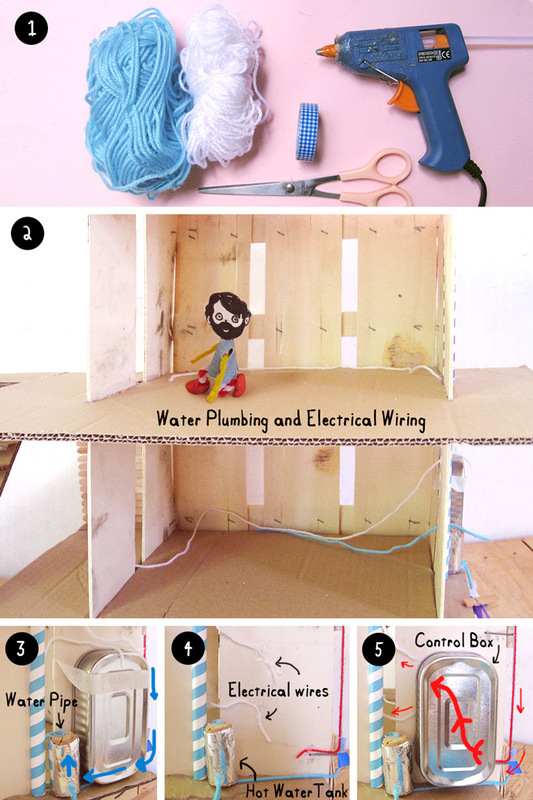 The wiring and plumbing in this dollhouse are very simple. The kitchen and bathroom are both located on the ground floor so that we can reduce the number of pipes and then less power will be needed to heat the water. These pipes supply the kitchen faucet and washer with filtered rainwater from the water tank. The power comes from the control box and goes through the wiring all along the ground floor to supply the kitchen and bathroom appliances, the outlets and lighting. The bedroom also uses power for its lighting and outlets. Cut a long piece of yarn – this will be the electrical wiring. Run this piece from the control box to the first floor, and then add another piece all along the ground floor, through the kitchen walls and into the bathroom. 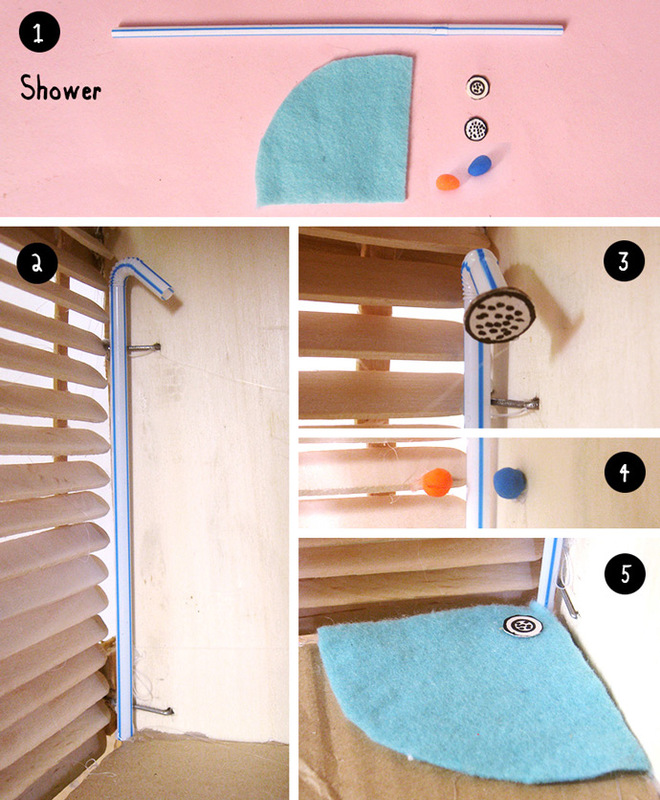 Pick a different color yarn for the water pipe, cut a piece, and use it to connect the hot water tank to two-thirds of the way up the kitchen’s front wall. Glue the water pipe yarn to the top of the hot water tank. 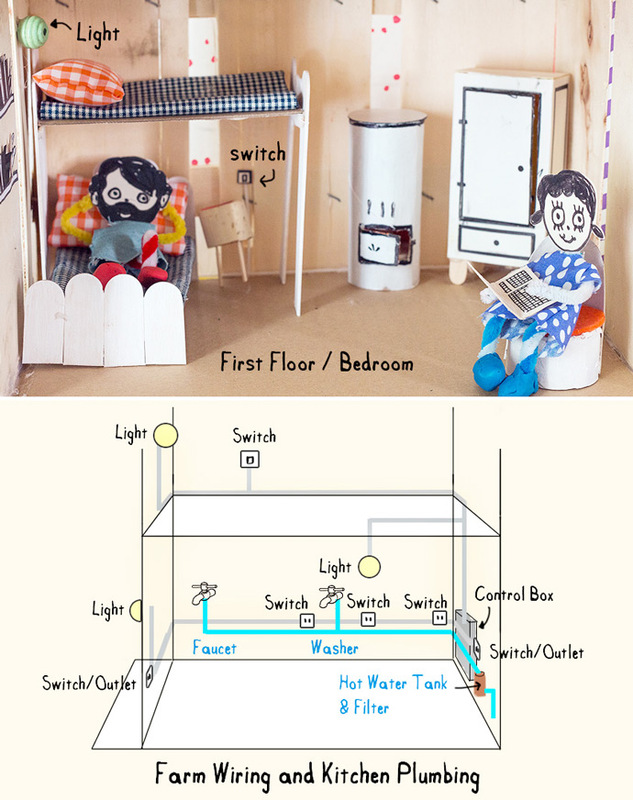 Remove the control box (the sardine can) and glue the electrical wires to the wall behind it. Replace the control box and glue it to the wall over electrical wires. Glue the first-floor wiring yarn all along the bottom of the walls. Use tape to attach the pipes and wires all around the ground floor walls. Pass the ground floor wire yarn out through the bathroom wall. The bathroom in the dollhouse has a cute cabinet with a sink and faucet, a vintage-style high tank toilet with a pull chain, and a tiny shower. In the next chapter, we’ll bring recycled water into the bathroom, but we’ll start with installing the furniture for now! You will need a bendy drinking straw, cardboard, play dough, plastic bottle cap, scissors and a pen. Start by cutting a 15cm by 2cm rectangle and a 6cm x 2cm rectangle from the cardboard. 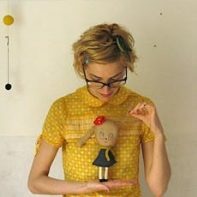 Next, trace the plastic bottle cap onto another piece of cardboard, and then make two tiny balls of play dough as shown. Cut out the lid shaped-circle from the cardboard so that it fits inside the lid. Draw the drain onto the sink: it should look like the circle with a smaller circle inside that, with five dots in the center. Glue this cardboard circle into the plastic lid. Cut a piece of the bendy straw to make the faucet, leaving 1/2” from the flexible part to the top end. To make the cabinet, fold the long rectangle 4.6 cm from each end (forming a square looking U-shape) and glue the small rectangle piece centered inside, forming a shelf. Glue the faucet on top of the cabinet with one play dough ball on each side as the knobs and then glue the vessel sink next to them. You will need: a bendy drinking straw, cardboard, play dough, felt, scissors and a pen. Start by cutting out a felt wedge to fit into a corner – this will be the shower base. 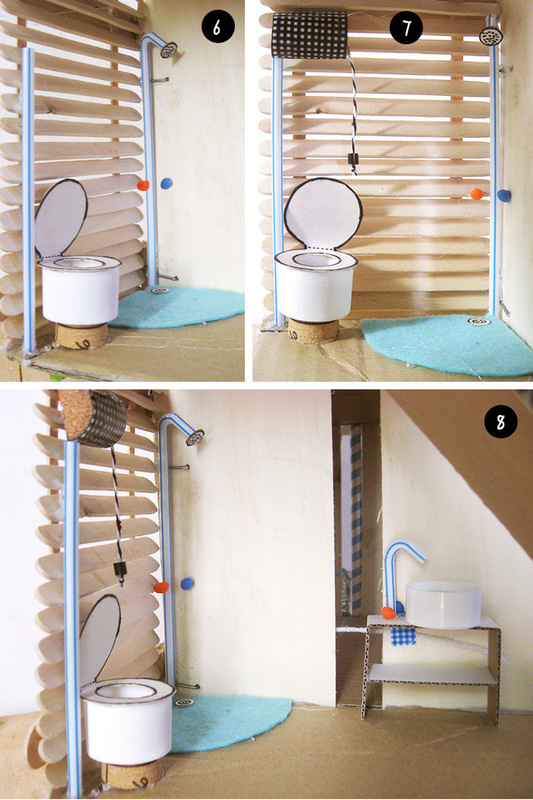 Cut out two 1/2” cardboard circles for the shower drain and shower head – use a pen to draw the details on them. Next, shape two play dough balls to be the knobs. Bend the straw and place it at one corner of the bathroom, cutting off any excess so that it fits in, leaving 1/2” from the bendy part to top end. Glue the shower head circle to the top end of the shower straw. Glue the knob handles on each side of shower pipe, around the middle. Glue the felt shower base at the bottom of the shower and then glue the shower drain next to the corner. You will need a plastic bottle cap, cardboard, bottle cork, scissors and a pen. To make the toilet seat, fold a piece of cardboard in half and trace the shape of the plastic cap next to the folded side. Add a border around it to make it slightly bigger and then cut it out leaving the folded edge uncut. Open the folded cardboard circle and draw a smaller circle centered on one of the sides. Cut it out.For the toilet bowl: trace the shape of the plastic cap onto another piece of cardboard and cut it out. Cut a straight edge off of one side so that it fits inside the plastic cap. This cardboard circle will be part of the toilet bowl, and a small sliced cork will sit under the whole toilet. Glue the cork to the base of the plastic bottle cap. 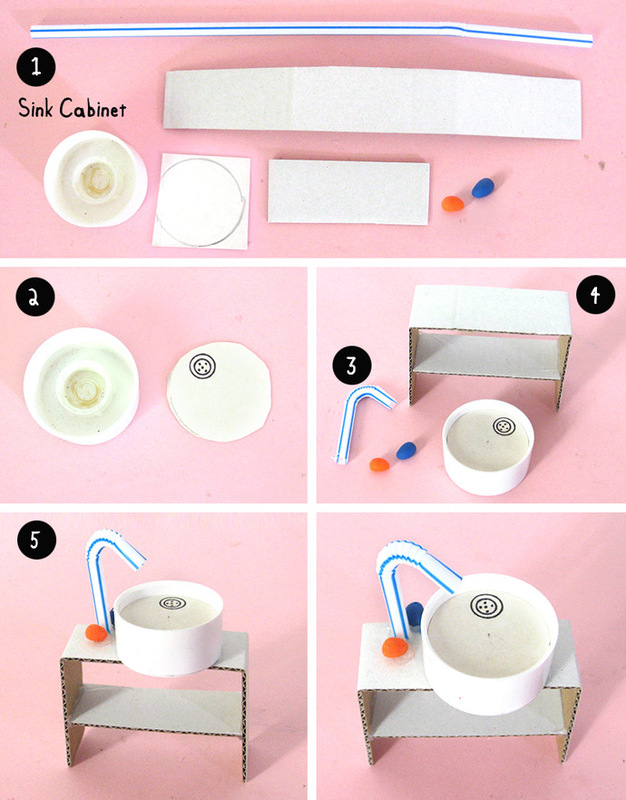 Fit the cardboard circle inside the bowl and glue in place. Glue the toilet seat on top of the bowl and center the folded side of the seat with the flat side of the circle that’s inside the bowl. 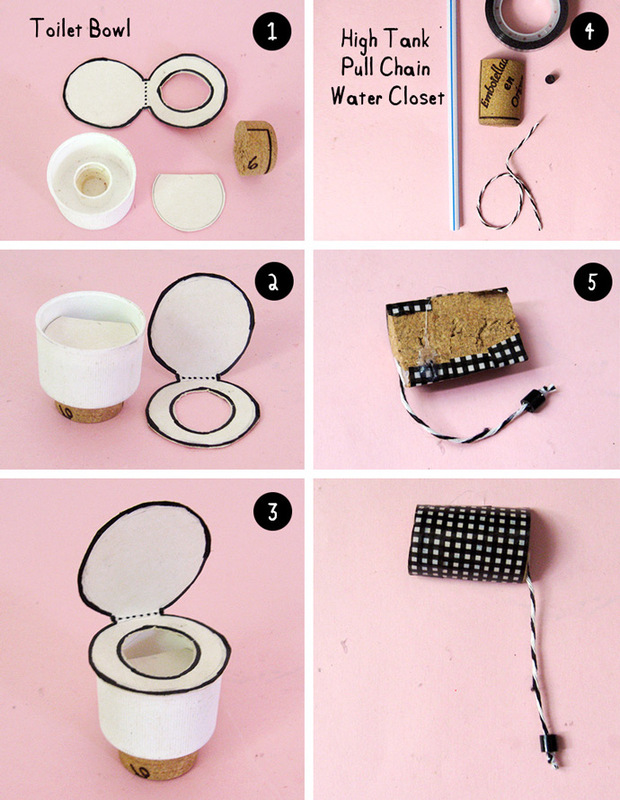 For the pull chain water closet, you’ll need a drinking straw, tape, half a cork, bakery twine, and a bead. Wrap the cork with tape. Cut a 2” piece of bakery twine, thread the bead onto it, and tie a knot on one end. Glue the other end of the twine to the top of the cork. Place the toilet close to the front edge of the bathroom floor and put the drinking straw next to it – this will be the pipe for the water tank. Cut any excess straw away so that it fits below the ceiling – don’t forget to leave space for the water tank to be attached on top – and glue. Glue the tank water closet to the wall, right above the straw. Place the sink cabinet centered on the other wall of the bathroom. Our dollhouse’s bathroom is almost finished! 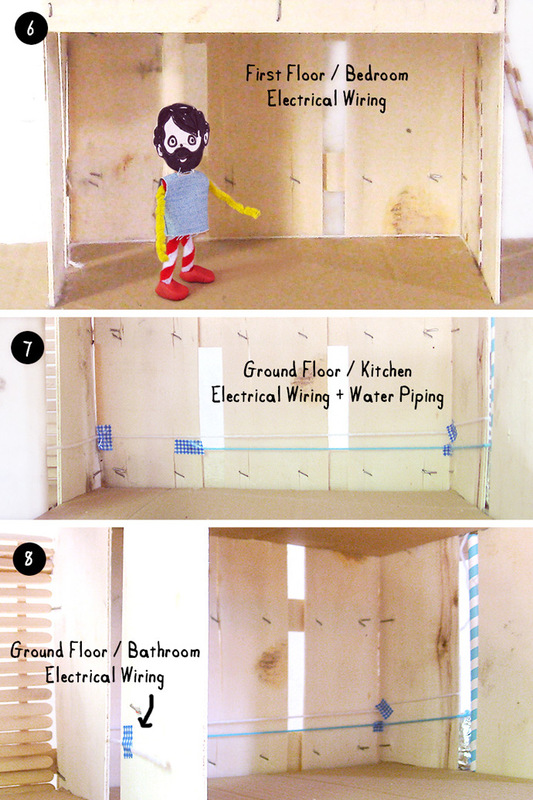 In the next tutorial, we’ll install the bathroom’s pipe and sewer system to supply recycled gray water from a pond. We’ll also work on the kitchen by crafting the kitchen appliances and cabinets!